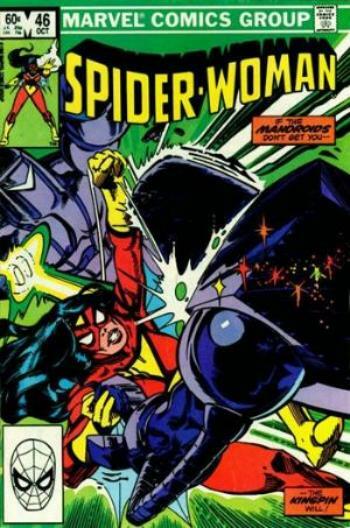 In this 1982 Jessica Drew (that rhymed) adventure we find Spider-Woman fighting assassins in the ocean and the female hate'n Mandroids. What the heck is a Mandroid you may ask...well, beside a name familiar to the Doctor Who universe, they are basically armored suits (worn by men...believe it or not) that have hand blasters and are built for two things: watching kittens try to figure out treadmills and destroying! Spider-Woman is the meat in the man-wich cover the comic of the day is rocking. As you can see, Spider-Woman is down to crack a helmet or make a Mandroid's back sparkle. Take that evil! Spider-Woman #46 does have an interesting part in the story where Drew helps the Kingpin (of all people) to safety while she protects him from the Mandroids. The Kingpin later helps Drew by stopping a good who is hoping to kill Spider-Woman for a reward. Kingpin lives by a certain honor and did not wish the woman saving his life harm. He even goes on to call off a kidnapping because Drew asks him to. There is a weird friendship or chemistry that Kingpin seems to take to. He even mentions wishing all of his relationships with Spider like heroes could be so enjoyable. I think the fat man was smitten with Jessica Drew. Why have we not seen that explored? With Vanessa Fisk dead maybe someone should take the events of this one obscure issue and run with the unlikely pairing of Jessica Drew and Wilson Fisk.